Our thanks to our comrades in the First of May Anarchist Alliance, who reached out to conduct this interview, and published it on their site originally, on December 4th. We republish it here with permission. We added a few links that were not in the original. Check out, also, the PDF version of the interview which they created, including many cool photos. A PDF of this interview is here. The General Defense Committee of the Industrial Workers World (IWW) has become an important pole of struggle for pro-working-class revolutionaries in the Twin Cities. While active on a number of different fronts, it is the participation of the General Defense Committee (GDC) in the year-long struggle against police killings and brutality in the Twin Cities that has largely led to the significant growth of the organization. The GDC has grown to approximately 90 dues-paying members in Minnesota, and has several active working-groups. In the wake of Trump’s election victory, Wobblies(1) and others across the country have begun establishing their own GDC locals – strongly influenced by the Twin Cities’ model. 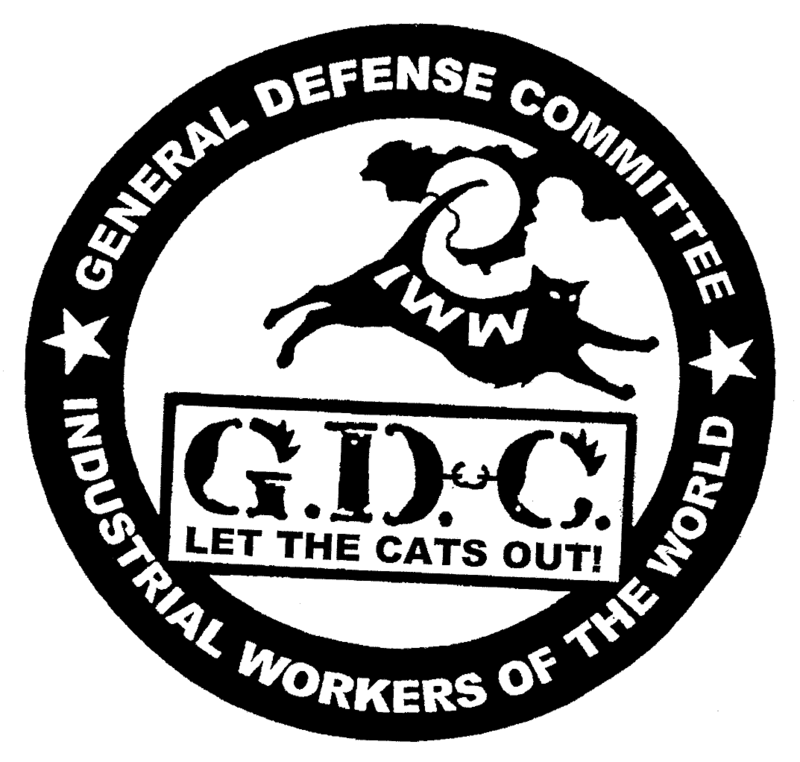 First of May Anarchist Alliance spoke to Erik D. secretary of the Twin Cities GDC Local 14 about the history and work of the General Defense Committee there. Erik is a father, husband, education worker, and wobbly, who’s also been involved in the youth-focused intergenerational group, the Junior Wobblies. Fellow Worker Erik – can you tell us about the origins and history of the General Defense Committee, its relationship to the IWW and how the militants who founded the current Local conceived of it? One of the first projects of the Twin Cities GDC was organizing a “Picket Training”, which seems like a kind of simple project, but you all attached some importance to it. How come? Finally, 2008 was the end of an intense two-year process organized at disrupting the Republican National Convention. Most of us already had a critique of ‘summit hopping’ styles of disruption, few of which have been effective since before the FTAA in Miami 2003. But a number of wobblies were serious and on occasion influential participants in (at least the early period of) the two years of planning that ended up calling itself the “Welcoming Committee.” The Welcoming Committee meetings (which were held in the same community space as the early IWW at the time, the Jack Pine Community Center) hammered out some early agreements and principles, including, along with other interested groups, the well-known Saint Paul Principles. This process also gave local wobblies experience in critically thinking through on-the-street tactics and what it would take to actually win goals and actions on those streets, whether in labor pickets or direct actions(2). All these motivations and experiences were in the forefront of our minds when we thought up the picket training. We knew we had to get better at this, and though we all had some experience, that’s not the same thing as having teachable knowledge. So we researched, wrote, debated, and practiced. We adopted a principle of teaching the tactics quickly, rather than perfecting the training first, and encouraged people to think about themselves as the next trainers. In order to keep track of our curriculum and to make it portable, we created a trainer’s manual, a trainee manual, and a setup manual, which we update frequently. Anti-fascism seems to have been a key concern for the Twin Cities GDC from the start. Can you explain a bit about why this was the case and how the GDC intended to “do” anti-fascism a bit differently than other antifa groups? Partly that was organic, because of the people involved. One of our members was a member of the Baldies, and later Anti-Racist Action, and brought a lot of experience on that front to the table(3) .Others also had anti-fascist experience. Given that density of experience and expertise, it was fairly natural that we were interested in anti-fascism from the beginning. Our first major action was the disruption of a David Irving event(4). Like most of his events in recent years, promotion and entrance to these is secretive and even paranoid. We created fake identities and profiles, acquired tickets and location information, and mobilized over 80 locals who hated the idea of fascists meeting in our city. This put our early group’s planning abilities to the test, since the meeting was on an upper floor of a downtown hotel with a front desk by which everyone would have to walk. As we went along, and based in part on discussions and debates both internal to the GDC and to the local IWW, we formulated a clearer understanding of the relationship we think should exist between anti-fascist work (I think these days, I’d say “Community Self Defense,” which would include antifa work) and unionism(5). It seems apparent that the GDC really “took off” during the recent upsurge against police killings in the Twin Cities (Jamar Clark, Philando Castile, Phil Quinn, Michael Kirvelay & others) – could you say a little bit about why this was the case, how the GDC oriented itself and what allowed it to be a place for militants to come and to grow? Local youth tended to a far greater degree of militancy, and simply understood more clearly what was necessary to protect the encampment, regardless of whether the self-appointed official protest leaders thought. We often provided security at night, when cars would drive at us menacingly, or shots would be fired in nearby alleyways. We were not present in an organized fashion at the moment when White Supremacists showed up and shot people at the occupation, and so I can’t say how well we would have responded that night. As a consequence of that event, and a lot of others similar to it, the GDC wrote and released a public statement explaining ‘badjacketing’ and demanding that no one involved in seeking justice should engage in it(6). We pushed that line hard for what felt like months, but was really just about a week during the occupation. Then the tide started turning and a large number of groups and individuals began to consider the downsides of that sort of action, and condemn it. I think the outcome of our stance against badjacketing actually was greater over time and after the occupation. For those that aren’t so familiar with the last year of activity in the Twin Cities, what have been some high points and challenges of this struggle against the police- and how has the GDC concretely participated in and contributed to this struggle? We had already written up a report on Bob Kroll, summarizing his history with documentation, but hadn’t really distributed it(7). When Kroll started lying in public about the details of Jamar Clark’s murder by two MPD officers, we released the report along with a demand that local reports stop allowing him to comment on subjects related to race and policing, without mentioning his background. We had a big effect in publicizing Kroll’s history, to the point that he’s been complaining about how frequently people refer to his background, calling him a White Supremacist, etc. We’ve had little to no effect on local reporters, unfortunately. We’re still fighting for justice for Philando and all those murdered by the cops. After Philando was murdered, a group of mostly younger activists marched to Minnesota Governor’s Mansion, not far from the school where Philando worked. That occupation remained in place for some time, but never reached the militancy or organization that we saw at the Fourth Precinct, for a bunch of different reasons. After the occupation was cleared out, the GDC organized and called for a rally and march to shutdown the two municipally owned liquor stores, which help to directly fund the police department whose officer, Jeronimo Yanez, murdered Philando. This action drew the attention of more racists who tried to troll us. This was average and expected. We also drew explicit threats from Wisconsin National Guard veterans who claimed they would show up armed, and posted images of personally owned military weaponry on our pages to scare us off. We took these very seriously and began research and documentation. Shortly after, we released our security report on the situation, along with a public statement that we were unafraid, provide for our own security and don’t rely on police, and we were going ahead. We did create a few new security tactics appropriate to the situation, which were useful in keeping us all safe. Despite the threats, the protest was large and well-attended. We rallied at a point midway between the two stores, not letting on which store we were heading to. Before we even began marching, the both stores closed, which represented significantly more economic damage than we’d even hoped to inflict by picketing one of the stores. What kind of folks began to join and participate in the GDC? How was its composition similar or different from the IWW or the anti-police movement in general? So far, the GDC seems to have “succeeded” as a multi-racial organization – how is this? The Twin Cities IWW has been a fairly sizable and active Branch for years – this no doubt provided a good basis to build from, but there has also been some informal controversy and debate within the Branch over some Wobblies’ orientation towards the GDC. What were the concerns and how has that played out? Yes. The local GDC wouldn’t exist without the local IWW, and I strongly feel that GDC locals should encourage all eligible members to join the IWW and begin workplace organizing. In terms of controversy, it’s my impression that there were criticisms; I was definitely aware from the beginning that a few members opposed the formation of a GDC, but there wasn’t ever a clear debate or discussion. GDC members solicited critique and engagement from wobblies, but nothing much really came of it, unfortunately. How has the GDC maintained a democratic culture in the context of constant action and growth? What are the main ways for Defenders to communicate, raise ideas, and debate issues? How does political development work within the GDC – what would you like to see in terms of political and educational culture within the GDC? The projects we take on in the GDC are organized by working groups. As we’ve grown in numbers and capacity, the number of working groups has grown. Every new working group makes me excited. It’s thrilling partly because of the new energy, and the sudden appearance of people who are, perhaps for the first time, to fight. It’s exhausting because the task ahead of us is immense, and will require a nearly constant process of mutual education. Thankfully, creating trainings is something we’ve been doing well in the Twin Cities, and with the new energy, I’m hopeful we can continue to both grow and consolidate our growing power. We’ve started thinking about what the process of doing mass, mutual education would look like, and thinking of how to implement it. The point of all of our trainings, beyond the specific skills taught, is to spread the skills and analysis we have as widely as possible among the working class, in order to increase our confidence, competence, and militancy. The next year is going to lit, if we do it right. Finally, we’ve been debating and developing a long-term strategy for GDC growth in the Twin Cities. Without going into details, I’ll just say that the long term strategic and nut-and-bolts planning of our group is inspiring, and gives me hope. 3 The Baldies were among the first anti-racist skinhead crews in the U.S. Anti-Racist Action, is a radical direct action anti-fascist network that was a key to fighting KKK and neo-nazi organizing from the late 80’s until recent times.